During the 2007 Drum Corps International Summer Music Games Tour, California will not only play first-time host to the annual DCI World Championships this August in Pasadena, Calif., it will host a major regional event for the first time as well. Just a few hours up the road from Pasadena, Drum Corps International is pleased to bring the first-ever DCI West Championship to the brand new Stanford Stadium at Stanford University on Saturday, Aug. 4. 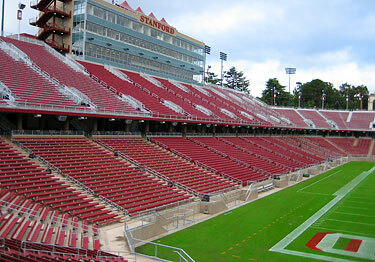 Stanford University's brand new Stanford Stadium will be the site of the 2007 DCI West Championship in California. Tickets for the DCI West Championship go on sale starting this Thursday, Dec. 7, at 9 a.m. Central time. Luxury "Skybox" seats for this event at $100 each will be available to 2007 Blue Devils and Santa Clara Vanguard donors and can only be purchased through the two organizations. Visit www.drumcorpswest.org for more information. In addition, $65 "Super Premium" seats in the center section will be available only to 2007 Blue Devils and Santa Clara Vanguard donors through Drum Corps International. These seats will be released to the general public after February 28. Regular ticket prices range from $20 to $50. Tickets for groups of 20 or more will be available for $10 in "Value" seat areas. Imagine seeing some of the top drum corps in the world on one of the most competitive, heart-pounding weekends of the season, just one week prior to the 2007 DCI World Championships! Take advantage of this early opportunity to reserve your seats for what could be one of the best stadium environments to ever play host to a Drum Corps International event, AND be part of what will be one of the biggest drum corps events ever produced in California. Visit the DCI West Championship ticket page on DCI.org to view a lineup of corps, a seating chart and additional event and ticket information.